Tilly was allowed out whilst we had our breakfast, no early start needed today as we’d not be going too far. When we’d finished our cuppas there was no sign of her so the mad cat woman came out again. I did think that we could be here for hours waiting for her to return, but luckily after a couple of minutes calling she came bounding from the direction of the bridge tail held high. A boat came past us from the lock as we were preparing to push off, so once the ropes were untied I walked up to the lock. It had only been about five minutes since the gates had closed but the lock had started refilling itself, already past half full. I spotted a wide beam coming from above and signalled to the lady that they should take the lock, then turned and signalled back to Mick that one was coming down. 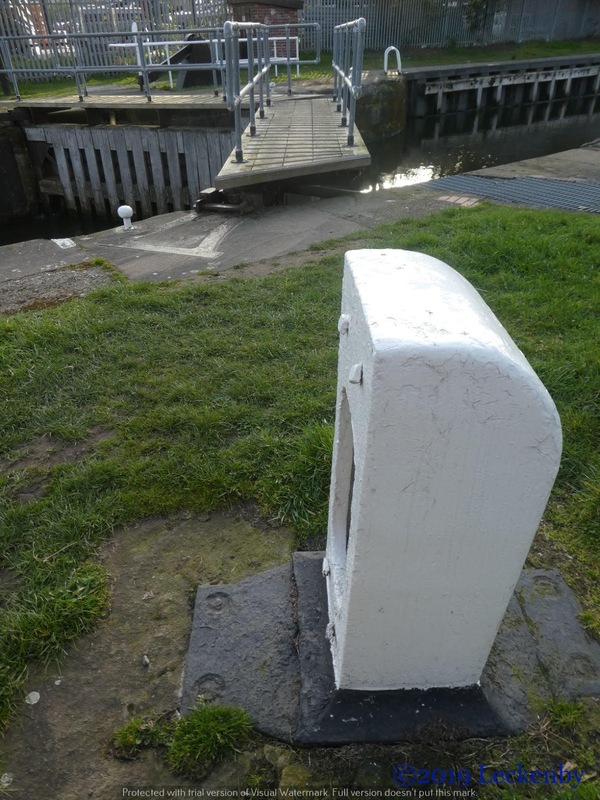 This of course took ages as the lock still had to finish filling, I closed the gates for them whilst the lady dropped their rubbish off, handed back their key and then worked them down. These locks are key of power operated like the ones up towards Sheffield. 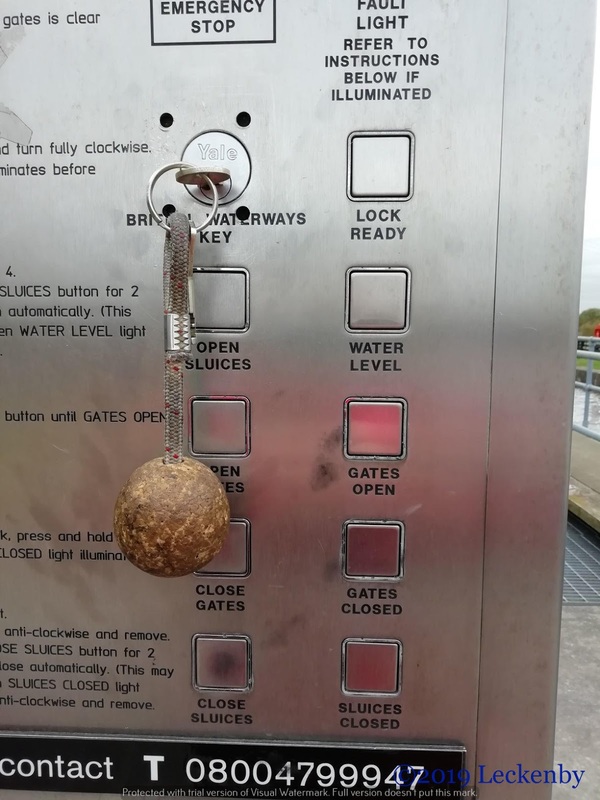 The difference being that there are no lights on these panels so you have to guess when the water is level to be able to open the gates. A few presses of the open gate button later and they responded. Once up the lock Mick did a 180 degree turn to get us on the water point and so that we could dispose of all our rubbish. Reversed back, winded and we were on our way. 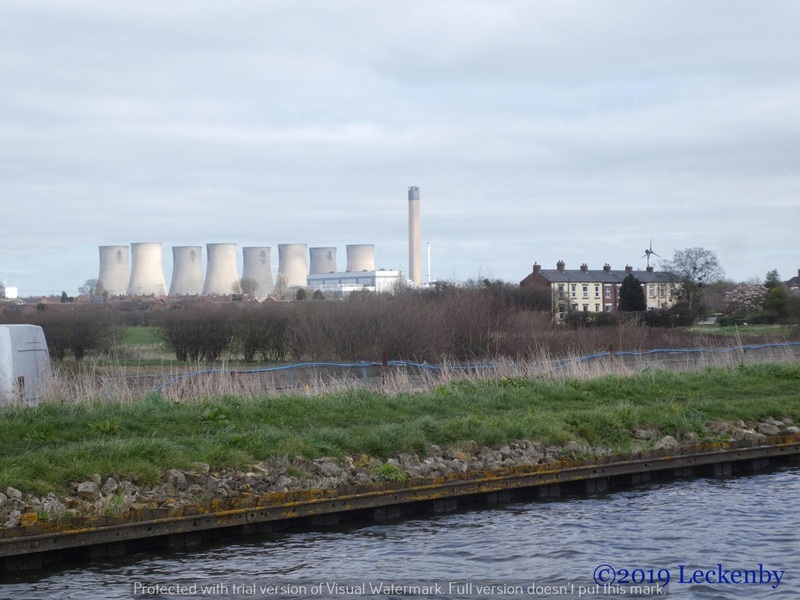 At points today you could see all three power stations at the same time, Drax, Eggborough and Ferrybridge, admittedly you have to move your head, but they all line up. So many cooling towers in one view. 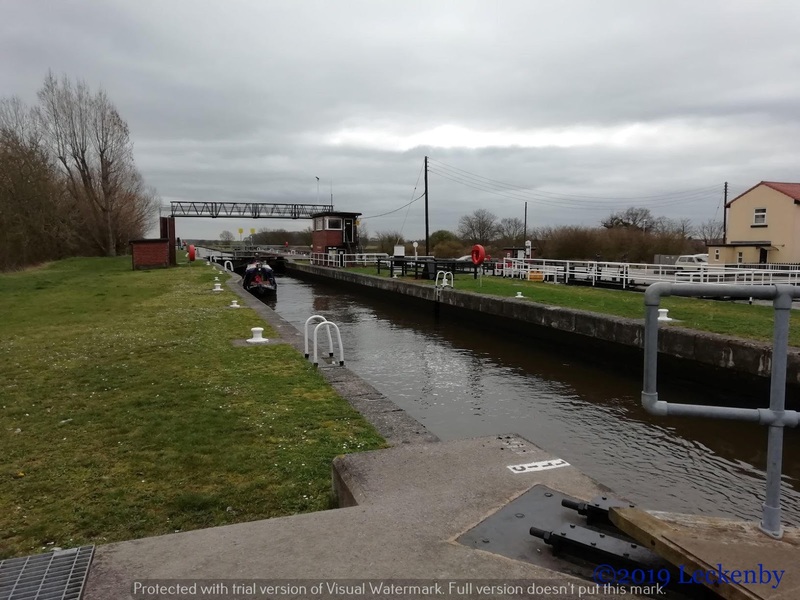 As we cruised Mick made a phone call to the Lock Keeper at Selby to check on tides next week. It was the same chap we’d booked with before for our aborted attempt. Booking made with plenty of time to get there. 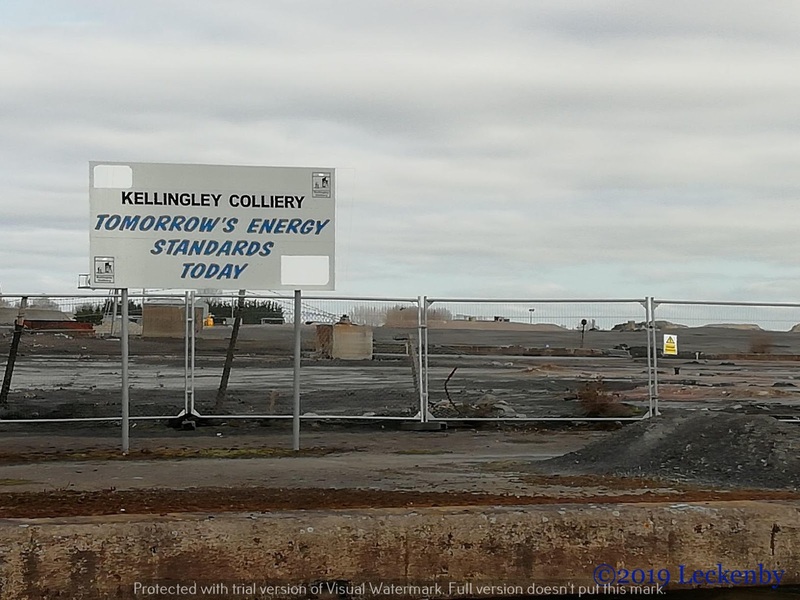 Over the last five years we have watched Kellingley Colliery being demolished, today there is very little left, mostly black rubble. 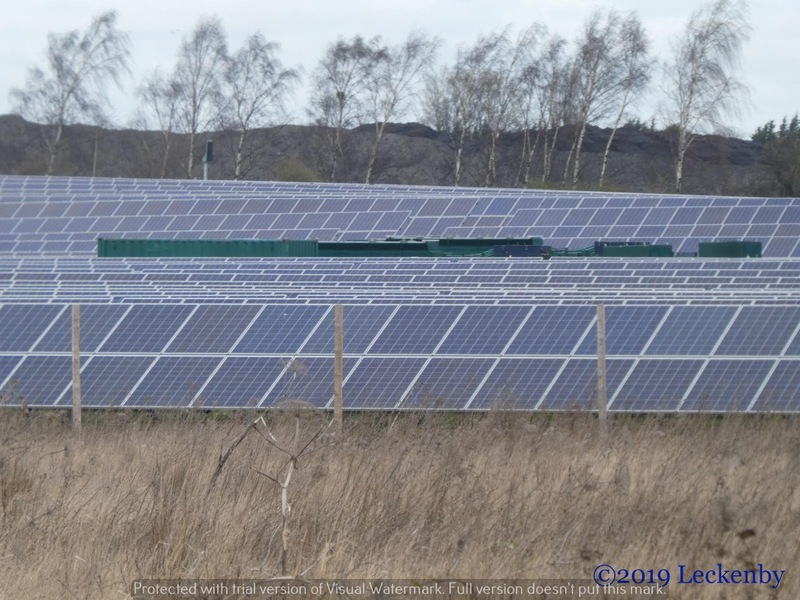 A large solar farm surrounded by slag heaps takes up some of the site, but the rest is now flat. 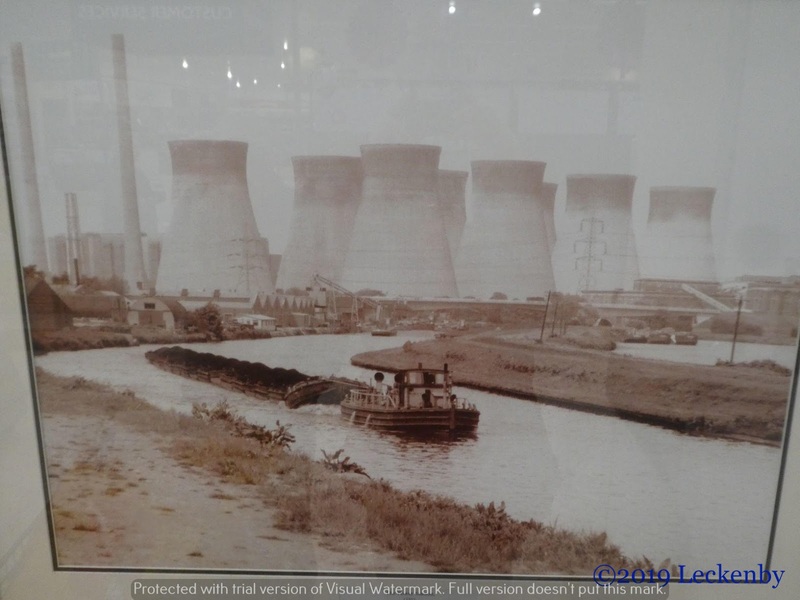 At Bank Dole Junction we carried straight on towards Ferrybridge the cooling towers getting closer all the time. 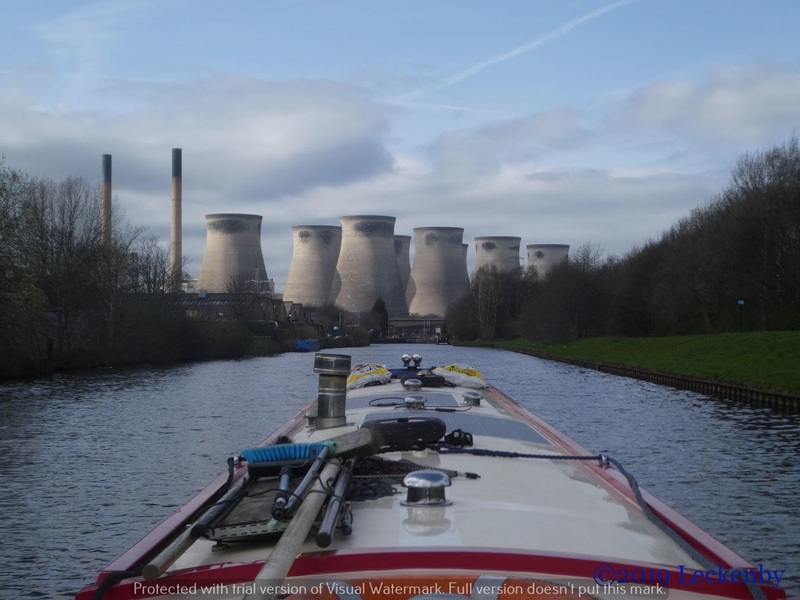 We wanted to find somewhere to meet some friends tomorrow, in the end we opted for the visitor moorings right by Ferrybridge Lock. 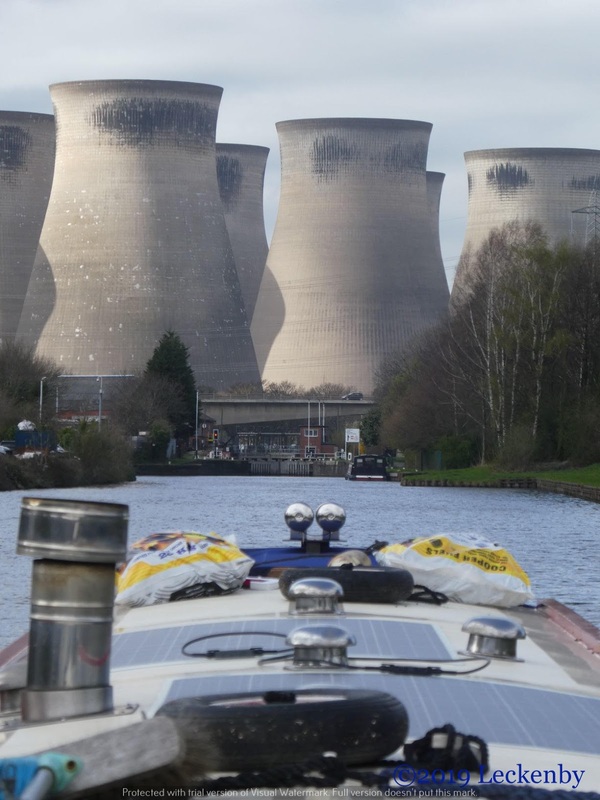 The last stretch of canal to the lock is totally dominated by the Power Station, one heck of a lot of extra NORF here! 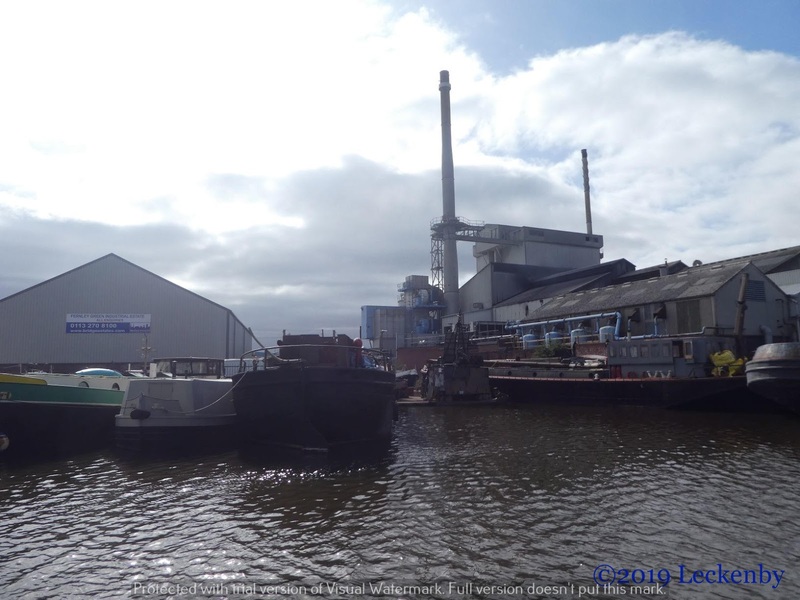 We pulled in behind two boats that looked familiar, a widebeam moored up on the opposite side. Too close to a factory with wagons for Tilly to go out, so she sulked for the remainder of the day. Some supplies were needed so we walked back through Ferrybridge to find Morrisons. The road route just enforced our opinion of the area, not one to spend much time. The route back along the canal was far better all green. A couple of boats came through the flood lock during the afternoon. There is still a couple of feet difference between the river and canal, normally there is hardly any. Levels are slowly going down, we’ll be keeping our eyes open for rain in the Dales as this will swell the Ouse again. Thank you to Paul of Waterway Routes for suggesting what the white metal things were at Pollington. He suggested that they might be stops for the end of the balance beams to rest against when they were manually operated. Here at Ferrybridge there are the same white things. They line up perfectly with the gates when closed. 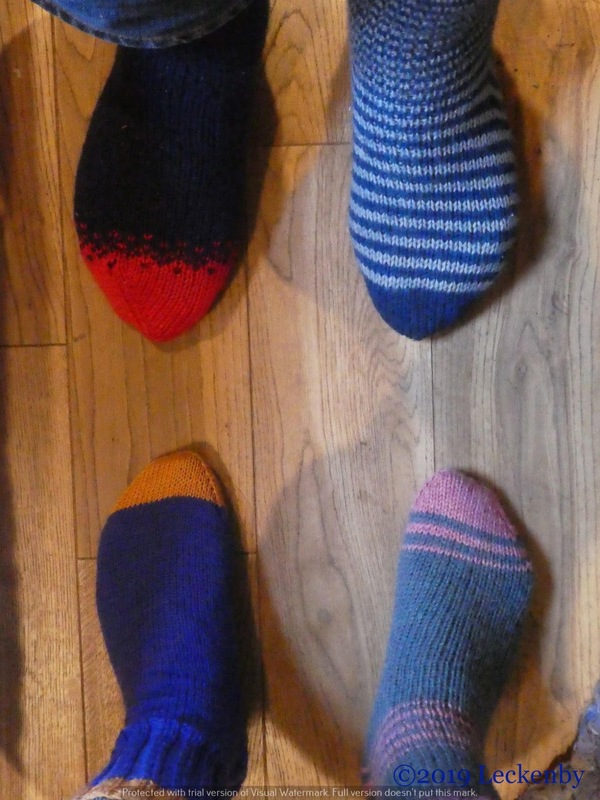 1 lock, 5.56 miles, 180 degrees for water, 1 wind, 1 left, 1 last space, 1 bag flour, 6 sausages, 6 roll fold and turns, 28 cooling towers, 8 Extra NORF, 1 sausage roll on account for Paul, 4 odd socks for World Down Syndrome Awareness Day. This entry was posted in Uncategorized on 23rd Mar 2019 by pipandmick. 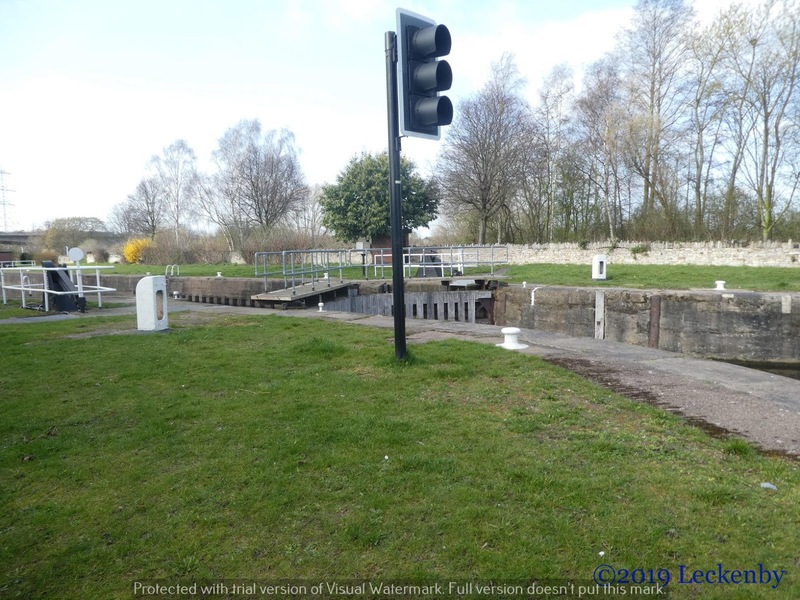 Let's hope they can fix Selby Lock by the time you get there! Mike, they are needing specialist parts to mend Selby Lock. We could be waiting a while. Yes – I've just come back to your blog as that Notice has just arrived in my InBox!I can understand the frustration – we tried to go to York in July 2017 but were prevented by floods. Had to go by train . . .